One of my favorite weeks of the year is here–the week of The Open Championship. Most Americans know it as the British Open, but when it began it had nothing else from which to distinguish it. So it’s just The Open Championship. This year it’s being played at Royal St. George’s in Sandwich, England, the southernmost course in the Open rota and one of the four English courses that hosts the Open. 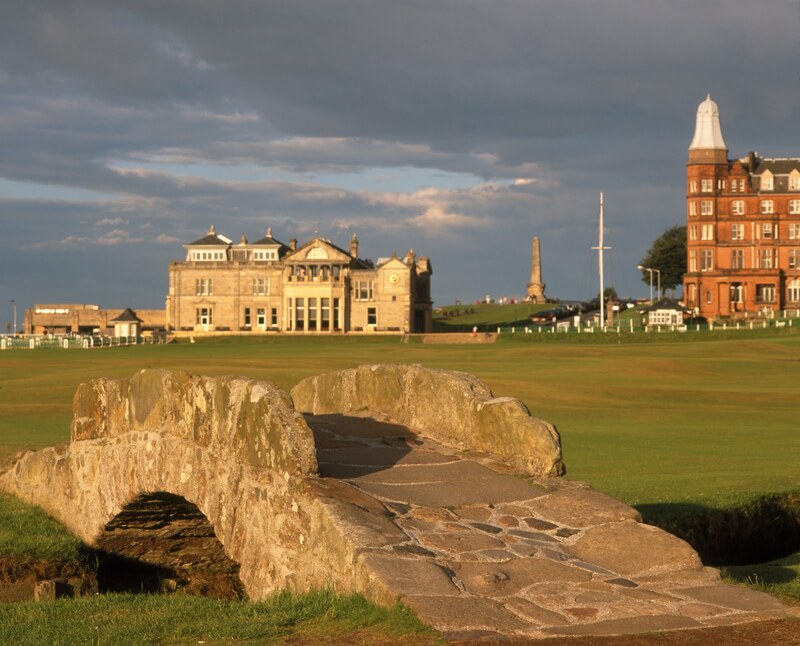 There are five Scottish courses in the rota but it’s most regularly played at the Old Course in St. Andrews, to which it returns every five years. I love the Open for many reasons. It’s held in mid-July, right in the heart of summer, usually when we’re on vacation or visiting family. A few sporting events epitomize the joy of summer for me–the baseball All-Star game and the Open are two of them. The bridge over the Swilcan burn on the 18th fairway of the Old Course, St. Andrews. The Royal & Ancient clubhouse is beyond the bridge, just behind the 1st tee box. The Open has a truly international field. It’s known as “the world’s championship” because players from the Asian tours and other parts of the world join those from Europe and the States. The 18th at Carnoustie, one of the toughest courses in the world. The Open is always played on links courses. “Links” is an old Scottish word referring to the rough sea-side turf that isn’t suited for farming or for anything else. Golf courses laid out on links ground tend to be quite firm. Drives get lots of roll and sometimes even good shots can roll into unfortunate spots, such as pot bunkers. The firm fairways also demand crisp iron play, and firm greens mean you have to land the ball in the right spot. Royal Portrush was the first links course I played when my family spent two summers in Northern Ireland doing ministry in the late 1990’s. Royal Portrush hosted the Open in 1951, the only time it was held outside of Scotland & England. I grew to love links golf during our four years in St. Andrews. The Links Trust charged one hundred pounds for a year’s pass to play the six courses on the St. Andrews Links. I was able to play the three championship courses (the Old, the New, and the Jubilee) dozens of times at an amazing price. If you had the pass you could also play Kingsbarns for a tiny fraction of the normal cost. It opened in 2000 and is already regarded as one of the world’s top courses. It’s right on the sea and is breathtakingly beautiful. Links golf demands creativity and control. This is especially the case at St. George’s, where well-struck drives will run off into score-inflating pot bunkers. It’ll be interesting to see how players handle the unpredictability. 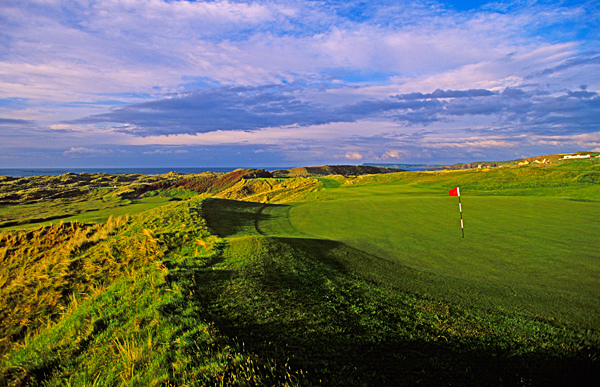 Check out Iain Lowe’s beautiful links course photography. I’ve got this lovely shot of the Auld Grey Toon in my office. You can follow the Open at the Royal & Ancient’s website. How nice to find an article on The Open in a Christian blog! Makes NT lecturers seem human! As a youngster I was mad about golf but when I was converted at university other interests took up my time. But I still like to follow the majors. My brother (& one of his sons who was there for a student tournament) played at St Andrews a few years ago. Louis Oosthuizen pulled off a great win last year. He’s from Mossel Bay, South Africa, the town of my birth. Was looking for your article on Eph 2 that appeared I think in Gospel Coalition & found your blog. Glad you book is out now. Yes, Oosthuizen played magically last and it was wonderful to see him win it in such a joyful style!